The tech world and women don’t always see eye-to-eye, but in Montreal, women-led startups are changing that. At a March 8 event for International Women’s Day, funky hair and tailored outfits clashed with the red brick and industrial decor. 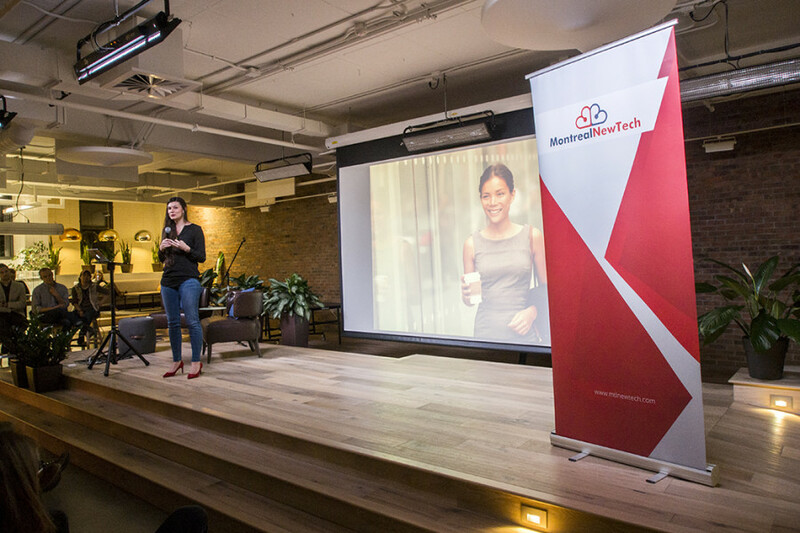 The event, put on by local startup supporter Montreal NewTech, was a platform for tech-savvy women to showcase their entrepreneurship. Seven women presented their pilot projects—from startups working on enhancing display technology, to online clothing rental websites. They all repeated the same phrase: get women involved in the technology sector—which remains a male dominated industry. “By changing the language, women will be less shy to apply for jobs,” said Deborah Kilpatrick, co-founder at SourceKnowledge and VP marketing, a marketing company that tracks a user’s post-click behaviour to improve performance. SourceKnowledge is one of the largest video platforms in North America. “By changing the language, women will be less shy to apply for jobs.” — Deborah Kilpatrick, co-founder at SourceKnowledge and VP marketing. Out of a team of 30, Kilpatrick said they’re still far from reaching gender parity. There are only two women on the executive team and no women on the development team. She said she’s never received a CV from a woman for that facet of the team. Women represent the majority of university graduates in Canada, but they remain underrepresented in science, technology, engineering, mathematics and computer sciences fields. 66 per cent of women graduate from non-STEM programs, while 39 per cent of women graduate with a STEM university degree, according to the 2011 National Household Survey. Today, women-led startups are changing the landscape by creating products made for women, by women. One of them is Cookit, the first company in Canada to provide meal kits. “When we tell future generations that we used to go out to grocery shop, they’ll laugh at us,” said founder Judith Fetzer. She said that Canada is lagging in the online grocery shopping business with less than one per cent of people purchasing their food online. Cookit delivers food kits to its customers, who can choose their meals from a variety of recipes. Lawyer-turned-entrepreneur Marie-Philip Simard founded Chic Marie after a colleague at her law firm had ordered her wedding gown online. The beautifully crafted white lace dress she purchased was no comparison to the product she received in the mail, an ill-fitting, green dress. Chic Marie is a clothing rental website. Customers choose clothes from the website’s interface, which functions like any clothing store, and receive it in the mail. But after you wear it, you return it. According to her research, Simard said, “A woman buys 65 pieces of clothing during the year but only wears 22 of those pieces on a regular basis.” It’s environmental waste, she added. As more women enter the tech world, the demand will match the supply. It’s about seeing your lifestyle reflected in a product, said Simard. That, ultimately, is the goal of these women and their mantra: they’re making the firms they want to see on the market.